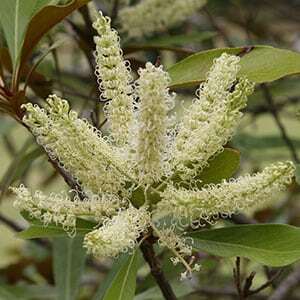 Grevillea baileyana is naturally found in tropical areas however is adaptable. Commonly called the ‘White Oak’, this is a small to medium sized tree that is covered with masses of creamy white flowers from spring through summer. The flowers are presumed and attract bees and birds to the garden. Although this is originally from tropical rainforest areas, it is a plant that will grow in cooler climates and drier soils. It is subject to dropping limbs in dry conditions. It will grow well as far south as Melbourne where its height seems be limited. Plant in an open sunny position in cooler climates, and light shade in warmer zones. A humus rich well drained soil is best however it will tolerate poorer soils. Best planted away from drainage and sewerage lines as the root system can be invasive. Easy from seed also possible from cuttings. 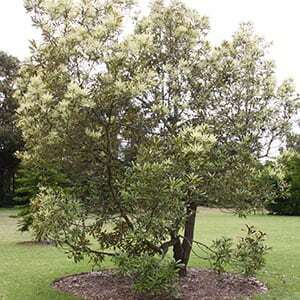 Common Names – White Oak or Brown Silky Oak. Origins – Tropical Queensland to New Guinea. Light – Dappled shade to full sun. Height – To around 10 metres, sometimes twice this. Foliage – Glossy green with brown underside. Root system – Vigorous and can be invasive.